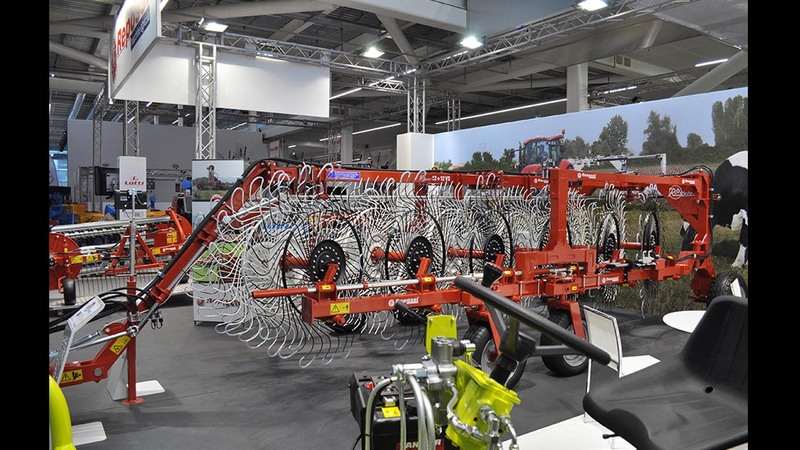 Researchers at the Agriculture Department at Milan University have calculated the savings achieved by a new double-wheel Ra-Rake. Raking is a critical if you want to obtain high quality forage and traditionally this was a high cost as merger rakes are expensive and sidebar rakes are not available for large working widths. This has now changed and it is possible to combine quality and savings thanks to the double wheel Ra-Rake rake. In 2017 Repossi Macchine Agricole obtained a Horizon 2020 funding which is offered by the European Union to promote and support innovation, research and technological development, to develop the new rake. Gabriele Repossi, inventor of the new rake had the idea of equipping it with two wheels of different diameters: the larger one does not touch the forage, but only has the task of moving the second wheel, which is smaller and moves the forage without polluting it with stones and soil. Since the rake does not need complex and expensive mechanisms to move the smaller wheel, it benefits from reduced costs (both for purchase and maintenance) and allows it to operate at high speed. The Department of Environmental Sciences and Policies of the University of Milan, in charge of assessing the advantages obtainable from Ra-Rake – using internationally recognised methodologies, has carried out preliminary assessments on a prototype of the rake, which will be on sale in May 2019. “In comparative tests, we have calculated that those who work about 200 hectares per year (in the case of alfalfa, 5 cuts for an area of 40 hectares), if they use Ra-Rake instead of the rotary can save about €1400 per year, “says Jacopo Bacenetti, researcher at the University of Milan, “and on a larger area (1000 hectares worked per year) the savings are €4900, while on 2000 hectares is as high as €9800”. Even with regard to the merger rake, used mainly on large areas, Ra-Rake demonstrates its positive economic impact, since it saves around €13000 per year. The cost per hectare has been calculated by adding all the costs related to the machinery: the initial investment, the hourly costs of the operator and the out-of-pocket expenses for use and maintenance (diesel, oil and lubricant).